iSOIL is a collaborate project co-funded by the Research DG of the European Commission within the RTD activities of the FP7 Thematic Priority Environment. 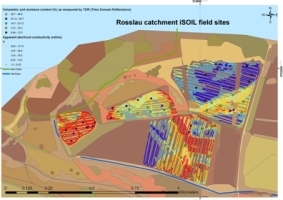 iSOIL will develop, validate and evaluate concepts and strategies for an improved soil mapping. Therefore, three topics are of major methodological interest (1) Development of geophysical techniques, (2) Development of geophysical transfer functions and (3) Digital Soil Mapping. This requires the combination and integration of different measuring techniques, of pedometrical and pedophysical approaches, enhanced DSM techniques, as well as subsequent modelling approaches. In so doing, structures of landscapes and different types of land use must be taken into account using a hierarchical approach. The final aim of the project is to provide techniques and recommendations for high resolution, economically feasible, and target oriented soil mapping under conditions realistic for end-user. An important aspect of the project is the sustainable dissemination of the technologies and concepts developed through workshops at regional level, international conferences and publications. For this purpose a handbook with set of guidelines or best practices on how to use and choose different soil sensors within the mobile sensor platform depending on the aim at hand will be written and published. Concept of mobile measuring platforms, Integration of “known” sensors such as EM38DD, EM31, gamma-ray spectrometer, magnetics, hyperspectral measurements. Definition of relationships between (combinations of) measured geophysical parameters and the soil characteristics of interest. JRC as the Focal Point for Soil Information in Europe will perform research on how to transfer the knowledge/data/algorithms gained by the WPs 1 to 5 into the ESDAC data structure / algorithm database as well participate in WP4 - Pedometrics with modelling of soil threats. Journal "Quality Assurance and Safety of Crops & Foods"
Germann, P.F., and S. A. al Hagrey. 2009. Gravity-driven and viscosity-dominated infiltration into a full-scale sand model. Vadose Zone Journal7:1160-1169. Cassiani, G., A. Kemna, A.Villa, and E. Zimmermann, 2009, Spectral induced polarization for the characterization of free-phase hydrocarbon contamination in sediments with low clay content, Near Surface Geophysics, special issue on Hydrogeophysics, p. 547-562.